T.S. Eliot’s “The Love Song of J. Alfred Prufrock” was the poem that made me decide to become an English Major. J. Alfred Prufrock is characterized as a nebbish man who despairs his aging and his inability to act on his desires. His social and sexual anxieties paralyze him at the point of romantic connection. He fears being laughed at or, worse yet, being misunderstood. Moving from black and white waves down to the “chambers of the sea” describes a vertical descent into a Dantesque hell of alienation. The world is curiously silent underwater. It is a very isolating experience, though peaceful for some. As Sartre, said: “Hell is other people.” We are only in pain at our loneliness inasmuch as we are aware of how much we want other people. 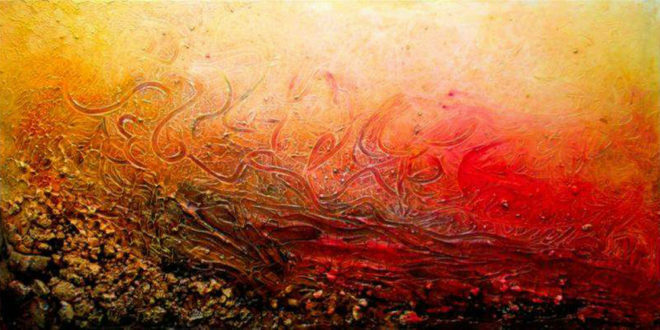 The painting is reminiscent of a fireplace, with suggested red and brown swirls to indicate seaweed or mermaid tresses. The lighting is the sort of luminescent lighting one sees when underwater. It’s peaceful… and yet not.